Tummy Tuesday: Join the Tummy Tuesday’s blog hop. Post anything about food: a restaurant review, a recipe, food photography, a funny food quote, a food song, an essay on food — anything food-related because you know like the song says, “Food, glorious food.” You can add your blog post’s link below in the MisterLinkys at the bottom of the post. I was in Tempe last week. My car was down but I also wanted to incorporate walking into my life so I walked over to the Bamboo Grill Yard instead of calling in a takeout. 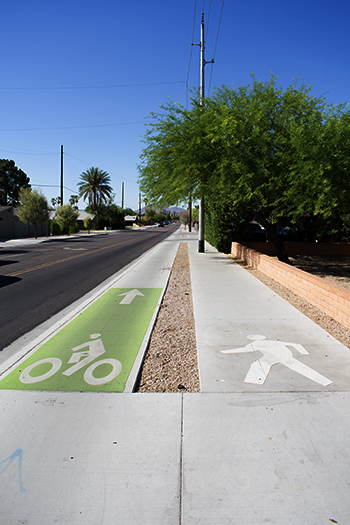 The street I walked along was a biking street so Tempe had two sidewalks — one for bicyclists and one for walkers. That is a great idea! It took me awhile but I got there. I was surprised at how out of shape I am because when I used to live here in my 20s, it was an easy walk. I used to walk to the university daily back then. Bamboo Grill Yard is a Sichuan (Szechuan) style take-out place. It’s a tiny place with two small tables and a counter. Because they had lucky cats as decor, I loved the look. 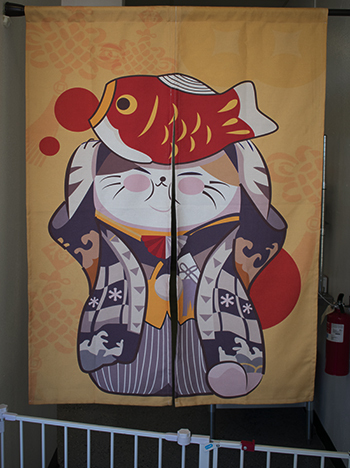 I am a sucker for Maneki nekos. 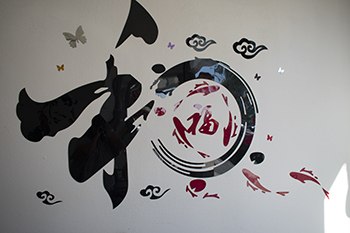 I also like the sumi-looking wall art. I ordered Sauteed Beef with Mixed Vegetable for $9.99. It came with rice. Since the place geared towards take-out, they came out on plastic microwaveable plates. I was not ready for the walk back so I sat down with my meal. I loved the variety of veggies with the beef. They tasted crunchy, lightly cooked which is how I like my vegetables. The beef was plentiful and tender. The rice was good. There was enough that I only finished about 2/3 and took the rest home. I was pretty happy with the food. Fair warning: While my plate was a nice reusable microwavable dish with a cover which is a definite plus, it is not water-tight. They wrap it with saran wrap if you have sauce so it is fairly spill-proof when they give it to you but I unwrapped it to eat there. When I wrapped it back up to go home, I didn’t wrap it as well and I had a bit of a walk to get back — in a plastic bag with swinging arms. None of the sauce leaked out of the bag but it was a bit of a mess in the bag. The cover on the dish never came off though. I should have asked them to rewrap it but didn’t think of it. 2. Mocha Almond Chocolate Chip Cookies! (photo) : Kathe W.
I would have loved this meal. Not the walk back and the mess in that bag, but everything else sounds wonderful. I’m hungry now. I think if I had just called for delivery, it would have been nice and neat (but I wouldn’t have burned the little bit of calories that walking does). Isn’t it funny how food pictures make you hungry. Yours made me hungry too. Hope you’re having a fantastic week. 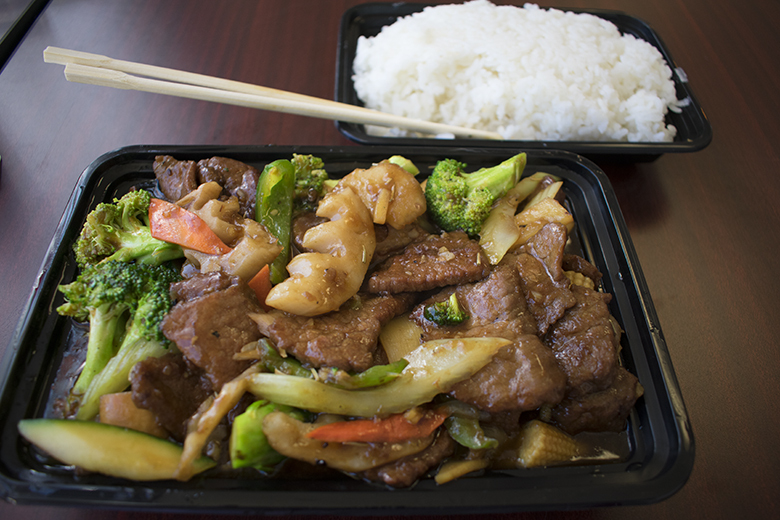 The Sauteed Beef with Mixed Vegetable looks delish! That last picture of the kitty is so cute! Thank you. I love taking food pics. 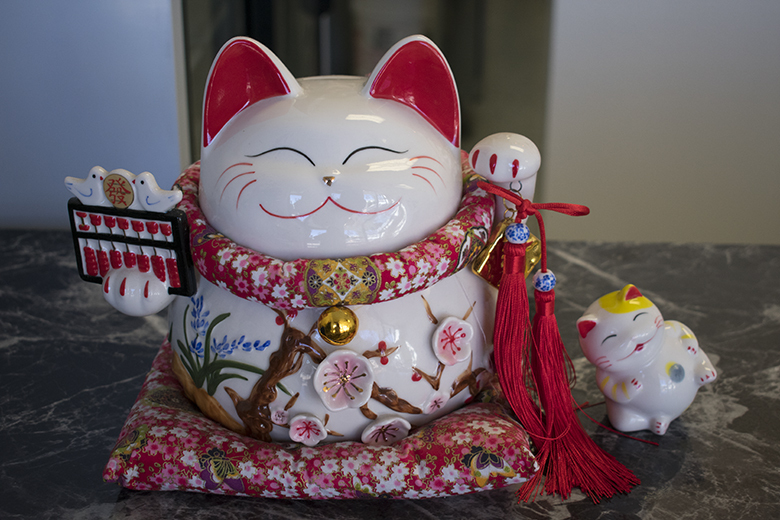 I agree, the lucky cats they had at the Bamboo Grill Yard are cute. Good point about issues with wrapping not being leak-proof; good job it didn’t leak out of the bag and on to you as you were carrying it though. Strange that I wasn’t hungry before reading this, and now I am! Wouldn’t it be cool if we could teleport food across the world like on Star Trek? It would be fun to share food experiences with blogger friends. Yeah, people rarely walk in Arizona during the summer so wrapping stuff up is based on people driving things home. I have the same reaction to food pics– I get hungry too! I almost dies once by walking accidently in the bike lane. Sorry to hear that. They must have been riding very fast. My sister snatched me out of the way. That’s a wonderful sister to think so quickly and rescue you!